Masoumi, S., Towfighi, J. (2015). Characterization and optimization of SAPO-34 catalysts synthesized by mixed templates in MTO reaction. Iranian Journal of Chemical Engineering(IJChE), 12(4), 4-14. Sh. Masoumi; J. Towfighi. "Characterization and optimization of SAPO-34 catalysts synthesized by mixed templates in MTO reaction". 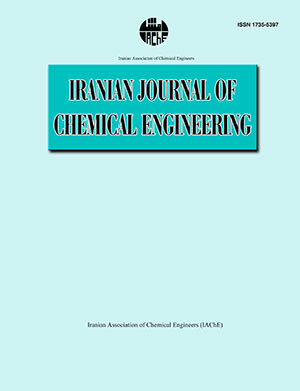 Iranian Journal of Chemical Engineering(IJChE), 12, 4, 2015, 4-14. Masoumi, S., Towfighi, J. (2015). 'Characterization and optimization of SAPO-34 catalysts synthesized by mixed templates in MTO reaction', Iranian Journal of Chemical Engineering(IJChE), 12(4), pp. 4-14. Masoumi, S., Towfighi, J. Characterization and optimization of SAPO-34 catalysts synthesized by mixed templates in MTO reaction. Iranian Journal of Chemical Engineering(IJChE), 2015; 12(4): 4-14. "> The effects of templating on the catalytic performance of SAPO-34 catalyst have been investigated in conversion of methanol to olefins. SAPO-34 catalysts were synthesized using a different combination of morphine, tetraethyl ammonium hydroxide (TEAOH) and triethylamine (TEA) as structure-directing agents during synthesis of gel with nominal composition as 1Al2O3:1P2O5:0.4SiO2:2yTEAOH:2xTEA:2(1-(x+y))morpholine:70H2O. The different SAPO-34 samples were characterized by XRD, SEM, FTIR, BET, EDX and TPD techniques. Increasing TEAOH in synthesis gel led to decreasing mean crystal size. The catalytic performance of the synthesized catalysts was tested in MTO reaction at 410C and a feed WHSV of 6.5 1/h. The catalyst synthesized by combination of tri-templates exhibited highest light olefins yield in 100% methanol conversion. The optimum values (X=0.17, Y=0.34) were obtained by central composite design and response surface contour plots. Calegario, F. Figueiroa, B. Caroline, N. Simonance, J. and Domiciano, L., "Influence of framework composition over SAPO-34 and MeAPSO-34 acidity", App. Catal. A: Gen., 406 (1), 59 (2011). Rajiv, S. Julian, D. G. and Michael, C. P., "Comparing the acidities of zeolites and SAPOs from first principles", Chem. Commun., 61 (1), 131 (1997). Travalloni, L. Gomes, A. C. L. Gaspar, A. B. and Silva, M. A. P., "Methanol conversion over acid solid catalysts", Catal. Today, 133-135, 406 (2008). Lok, B. M. Cannan, T. R. and Messina, C. A., "The role of organic molecules in molecular sieve synthesis", Zeolites, 3 (4), 282 (1983). Ye, L. Cao, F. Ying, W. Fang, D. and Sun, Q., "Effect of different TEAOH/DEA combination on SAPO-34’s synthesis and catalytic performance", J. Porous. Mater., 18 (2), 225 (2011). Liu, G. Tian, P. Zhang, Y. Li, J. Xu, L. Meng, S. and Liu, Z., "Synthesis of SAPO-34 templated by dethylamine: crystallization process and Si distribution in the crystals", Micropor. Mesopor. Mater., 114 (1-3), 416 (2008). Alvaro-Munoz, T. Marquez-Alvarez, C. and Sastre, E., "Use of different templates on SAPO-34 synthesis: effect on the acidity and catalytic activity in the MTO reaction", Catal. Today., 179 (1) , 27 (2012). Wang, P. Lv, A. Hu, J. Xu, J. and Lu, G., " The synthesis of SAPO-34 with mixed template and its catalytic performance for methanol to olefins reaction", Micropor. Mesopor. Mater., 152, 178 ( 2012),. Masoumi, S. Towfighi, J. Mohamadalizade, A. Kooshki, Z. and Rahimi, K., "Tri-templates synthesis of SAPO-34 and its performance in MTO reaction by statistical design of experments", App. Catal. A: Gen., 493, 103 (2015). Lok, B. M. Messina, C. A. Patton, R. L. Gajek, R. T. Cannan, T. R. and Flanigen, E. M., "Crystalline silicoaluminophosphates", (1984). Casady, J. B. and Johnson, R. W.," Status of Silicon Carbide (SiC) as a Wide-Bandgap Semiconductor for High-Temperature Applications: A review", Solid-State Electronics., 39, 1409 (1996). Schnabel, K. H. Fricke, R. Girnus, I. Jahn, E. Lofﬂer, E. Parlitz, B. and Peuker, C., "Catalytic and Infrared Spectroscopic Investigations of the Molecular Sieve Types SAPO-34 and SAPO-41", J. Chem. Soc. Faraday Trans., 87, 3569 (1991). Marchese, L. Frache, A. Gatti, G. Coluccia, S. Lisi, L. Ruoppolo, G. Russo, G. and Pastore, H. O., "Acid SAPO-34 Catalysts for Oxidative Dehydrogenation of Ethane", J. Catal., 208, 479 (2002). Zubkov, S. A. Kustov, L. M. and Kazansky, V. B., "Investigation of hydroxyl groups in crystalline silicoaluminophosphate SAPO-34 by diffuse reflectance infrared spectroscopy", J. Chem. Soc. Faraday, 87 , 897 (1991). Parlitz, B. Schreier, E. Zubowa, H. L. Eckelt, R. Lieschke, E. and Fricke, R. "Isomerization of n-Heptane over Pd-loaded Silico-Alumino-Phosphate Molecular sieves", J. Catal., 155, 1 (1995). Dumitriu, E. Azzouz, A. Hulea, V. Lutic, D. and Kessler, H., "Synthesis, characterization and catalytic activity of SAPO-34 obtained with piperidine as templating agent", Micropor. Mesopor. Mater., 10,1 (1997). Lee, Y. Back, S. and Jun, K., " Methanol conversion on SAPO-34 catalysts prepared by mixed template method", Appl. Catal. A: Gen., 329,130 (2007).